Just as a team of Dutch researchers are pushing to publish the details of how they created an easily-transmitted mutation of the deadly bird flu virus, H5N1 has struck yet again in Hong Kong. 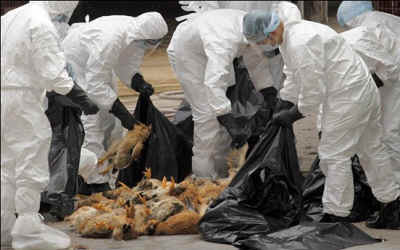 Health workers there have begun slaughtering more than 17,000 chickens on Wednesday after a “highly pathogenic H5N1 avian influenza virus” was found in a dead chicken at a poultry market. The government also raised the bird flu alert to “serious” and banned the same and import of live chickens for three weeks – to the consternation of people who celebrate the “Dongzhi” winter solstice holiday by eating chickens and other birds. “I understand that it will cause inconvenience to the public, and the poultry trade will also encounter losses,” said Food and Health Secretary Dr. York. We might respectfully add that it also causes “inconvenience” to the birds.